While 1990 marked the centennial of the official establishment of a Department of Architecture at Penn, courses in architecture were offered as early as 1869, making Penn’s the second oldest architecture program in the United States. In 1920 courses leading to degrees in fine arts and music were joined with those in architecture to form the School of Fine Arts, which took up residence in the Old Dental Hall (now Hayden Hall). 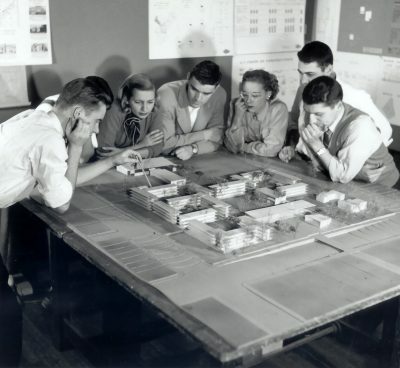 In the 1950s the School’s emphasis shifted to graduate curricula and the departments of architecture, city and regional planning, landscape architecture and regional planning, fine arts, and a program in urban design were established. In 1959 the School was renamed the Graduate School of Fine Arts and a decade later moved to the recently completed Meyerson Hall. In the 1980s programs in historic preservation and governmental administration were added to the school. In 2003 the Graduate School of Fine Arts underwent another name change; it is now known at the School of Design.